Don't miss the chance to join Oliver Langmead in launching his new brilliant second novel from small new press Unsung Stories! 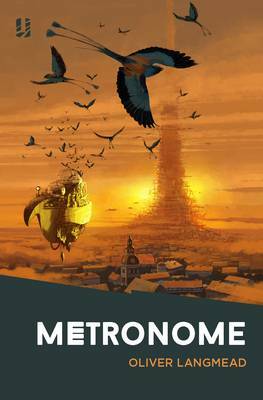 Metronome is a literary horror-fantasy like nothing else you've read, set in an Edinburgh care home and in a uniquely nightmarish dream landscape. It is for the entities known as Sleepwalkers to cross the doors between dreams, and hunt the nightmares that haunt sleeping minds. Theirs is a world of impossible vistas, where reason is banished and only the imagination holds sway: the connected worlds that all sleeping minds inhabit, and the doors that lead between. But tonight, one Sleepwalker has gone rogue. Abandoning her sworn oath to protect the dreamscapes, she has devoted herself to another cause, threatening to unleash a nightmare older than man. The only chance of stopping her lies with a man named Manderlay. Once a feted musician, William Manderlay is living his twilight years in an Edinburgh care home, riddled with arthritis and filled with a longing for his youth, for the open seas, and for the lost use of his hands and the violin he has always treasured. For too long now, Manderlay's nights have been coloured by dark, corrupted dreams: dreams of leprous men in landscapes plucked from his memory, of dark figures seeking him on city streets. His comrades in the retirement home believe Manderlay is giving in to age and senility - but the truth is much worse.For in dreams, maps are made from music - and it just might be that one of William Manderlay's forgotten compositions holds the key to unleashing the nightmare that holds the world of dreams in balance. The Sleepwalkers are zoning in on him. He might be their saviour, or his music might be their damnation...From the acclaimed author of Dark Star comes a literary fantasy like no other. Booking is essential; please ask in store or call 01412484814 for tickets.